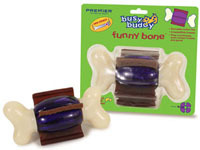 The Funny Bone is another addition to Premier Pet Product’s line of Busy Buddy toys. The tough nylon ends surround a hard polycarbonate core that really appeals to the dog that loves to chew. The Funny Bone holds four Gnawhide Strips, but you can put in just one at a time if you want. This toy has proven to be another indestructible chew toy for our dogs. Your dog will love not only chewing on the Funny Bone, but fetching it too! Coral loves it so much she’ll barely put it down. Watch the video to see the Funny Bone in action. Don’t stop with the Funny Bone! Your dog deserves a different chew toy every day of the week, so check out our demo videos on the Bristle Bone, Kibble Nibble and Tug-a-Jug and Bouncy Bone. Don’t forget a package of refills so you’ll have plenty on hand!